Written for the 5-8 year old age range, Of Numbers and Stars is a charming little book perfectly suitable for any Pagan or Heathen child. Here we have not only a strong female character, but one who is a Pagan philosopher and mathematician to boot. Children are immediately introduced to the Alexandria of two thousand years ago, a city known for its culture, craftsmanship and learning. They are then told of the birth of Hypatia to the house of Theon and of her family’s love and affection for her. Author D. Anne Love very delicately touches on the restrictions under which the average woman had to live, highlighting how extraordinary Hypatia’s upbringing and later vast scholarship truly was. She does this with a remarkably delicate and humorous touch and both the delightfully rich language and the cheerful and colorful illustrations work together to reinforce a certain sense of momentum that one day blossomed into Hypatia’s extraordinary intellectual fervor. That fervor, her love of reason and learning, and the heights which her intellect allowed her to reach form the focus of this book. I was a little concerned when I ordered Of Numbers and Stars as to how the author would describe Hypatia’s death, which was brutal, vicious, and vile. Parents needn’t worry. The book focuses on Hypatia’s love of knowledge and does not discuss either the religious furor that so defined her age or the horribly cruel manner of her death. There is an “Author’s Note” at the end of the book that glosses over the important details but this is obviously intended for parents and is not part of the actual text itself. Nor does it go into lurid details, but gives only a brief note. I do appreciate that this “Author’s Note” mentioned that Hypatia held her ground and refused to convert to Christianity and that it may have led to her death. Part of the immense charm of this book lies in its whimsical illustrations. 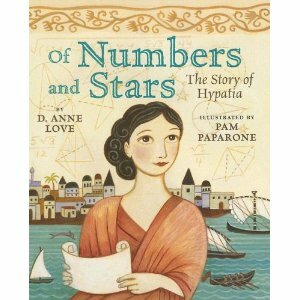 While the author reinforces Hypatia’s love of study (and quite cleverly provides a role model for children in that study, reading, writing, arithmetic, and speaking properly are presented as fun and exciting things to do), the illustrator, Pam Paparone, peppers the text with images and names to spur children’s curiosity or imagination. We have caricatures of Sappho and Alcaeus, Homer and Virgil. We see busts of Plato, Aristotle, and Marcus Aurelius, but also of Buddha and Confucius. The visual elements of both Egyptian and Greek culture make the story immensely atmospheric and they are blended quite cohesively throughout the book; furthermore, the illustrations accompanying the pages that talk of Hypatia’s interest in astronomy, or mathematics, or botany are enthralling collections of animals and plants, seeds, and constellations drawn in such a way that the reader almost feels as though he can reach out and grasp them. I liked this book immensely, not just because it introduces children to Hypatia, a fascinating and important historical figure in and of herself, but because throughout the book, both the author and the illustrator also introduce the arts, letters, and crafts that so formed the warp and weft of Alexandrian life. For instance, children who might otherwise not ever give a thought to where their drinking glasses come from are shown pictures of a man blowing glass as one of the delightfully detailed background illustrations. In the same vignette, we’re also shown a woman weaving on a loom. Girls especially are presented with a boldly independent thinker, a girl who grew into a highly influential woman despite living in what, to our standards, seems like a grievously restrictive culture. She “did her own thing” and wasn’t afraid to be different from her peers. To my mind, that’s an important lesson for children today, especially girls. Best of all, I think that kids reading this will come away with a feeling that maybe they can do this too: that the mysteries of the stars, of seeds, of planets, of the world around them are within their grasp; that they can learn things, acquire knowledge, and make their mark on the world too and moreover, that this is a good and enjoyable thing to do. That’s the real lesson of the book, I think: that there is joy in knowledge and it’s open to anyone willing to put in the time and study. I would recommend this book highly, giving it five out of five stars.